In my last article I explained that a Hybrid Solar Pool Heater is a combination of a solar pool heater and an auxiliary heater, either an electric heat pump or a gas heater. Hybrid systems can be an excellent choice, bringing together the benefits of each heat source while minimizing the drawbacks of each. In this article I attempt to explain and compare the various pool heating options available to Southwest Florida pool owners. The three most popular pool heaters that I will describe are solar pool heaters, electric heat pumps, and gas heaters (LP or natural gas). Geothermal heat pumps are also an option, but are very infrequently considered due to the initial cost and complexity. Essentially no additional operating costs. Performance limited based on the weather. Naturally I started with the bread-and-butter product of the local solar energy industry, and it’s what we try to steer people into. Solar pool heating offers the luxury of a year-round heated pool with little to no operating and maintenance costs. Solar pool heaters can keep your pool at temperatures about 10ºF above unheated pool temperatures, and up to 15ºF when using a pool cover. Because unheated pools rarely drop below 65 degrees in Southwest Florida, temperatures considered warm enough by most are attainable virtually year-round. In the spring and fall, solar heated pools are luxuriously warm, and in the summer, spa-like temperatures are often reached if heaters are not turned off. If you demand a particular temperature every day of the year, solar alone may not give you what you want. Believe it or not, people call us wondering why their pool isn’t 85 degrees when it’s 50 degrees and cloudy outside. After a cold spell, it can take a day or two to reach desired temperatures again. Despite these limitations, the trade-off of free heated pool water is a very attractive option. Not many people desire to swim when the ambient temperature is below 65 degrees anyway. Solar pool heating is the most efficient way to heat a pool in terms of total heating performance delivered. Economical heating during good conditions. Moderate to high maintenance costs (outside of warranty). Energy hogs, especially in cold weather. Poor performance in cold weather. Heat pumps are similar in cost to solar pool heaters, but have ongoing costs of electricity. Dealers and manufacturers claim “$1/day” heating performance, but the truth is in the small print. This analysis assumes a modest temperature, not warm enough for many pool owners, and exclusions are made for times when weather is cold. Why is this? 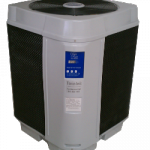 Heat pumps perform poorly when the outside air temperature drops. Heat pumps work by taking latent heat in the air and transferring it to the pool water through a heat exchanger. This is done by compressing and evaporating a refrigerant, just like you home’s air conditioning system, except in reverse. You will notice that cool air escapes from the top of the unit – that’s the “cold” coming out of your pool, or conversely the “heat” that is being put into your pool. If the outdoor temperature is high, especially in relation to the pool temperature, heat pumps perform great, costing relatively little to heat up a pool. The problem is, most people want to heat their pool in sub-optimal weather conditions. Similar to solar pool heaters, performance suffers as conditions deteriorate. However, with heat pumps, poor performance means big electric bills. Nonetheless, there is a good argument for heat pumps if you want to heat your pool sparingly when outdoor conditions are ideal. If you are an infrequent swimmer, willing to plan ahead, and willing to pay for electricity to heat your pool, heat pumps may be an acceptable alternative for you. Reliable pool temperatures year-round in any condition. Low initial cost (excluding tank installation and hookup if necessary). Extremely high operating cost (fuel). Maintenance, especially if heavily used. Limited fuel source (if tank-fed). Gas heaters are superstars when it comes to heating speed. You can raise the temperature of a pool by multiple degrees per minute in any conditions, limited only by the rating of your heater(s). The initial cost is often lower than a quality heat pump or solar pool heater, but costs for buried tanks can connection can offset those savings. Lifespans (and warranties) of gas heaters are shorter than heat pumps, especially if heavily used. The major drawback is operating cost. Because gas heaters are less efficient than heat pumps, it takes more energy to develop the same amount of heat. LP and natural gas are very energy dense, but also very expensive. Imagine heating 15,000 one-gallon pots on your gas stove. It takes a LOT of gas to heat water. Heating your pool every day to a set temperature can easily cost hundreds of dollars in sub-optimal conditions. However, if you are the type of person that doesn’t swim often, doesn’t want to plan ahead to heat your pool, absolutely requires a set temperature year-round, or has money to burn (pun intended), a gas heater might be a good choice for you. 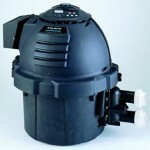 You can quickly see that there are great features and unavoidable drawbacks to each pool heating option. 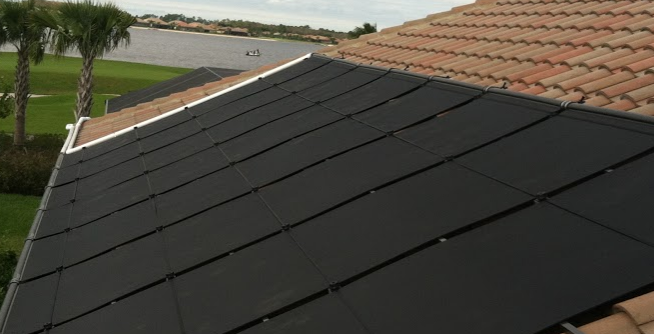 With a little thought, it becomes apparent that a combination hybrid solar pool heating system may be the ultimate option. If you can afford the upfront cost, you can let a solar pool heater take on the heavy lifting, heating your pool year-round to adequate temperatures most of the year, and “topping off” the pool to desirable temperatures when conditions are not quite good enough to meet your needs. In my circumstance, a solar pool heater with a gas backup is the best option. I’m spontaneous and infrequent with my pool use, and willing to bite the bullet and pay for gas when I want to swim in 50 degree weather on a whim (disclaimer – I have an unheated pool because I actually rarely use it, refusing to get in unless it’s 85ºF+ outside). If you are an avid swimmer for exercise, but willing to stay out of the pool when outdoor temperatures plummet, a solar pool heater with heat pump combination may be best for you, providing desirable temperatures most of the year at a reasonable operating cost. If you swim when the weather is nice, don’t want ongoing operations and maintenance costs, and love free super-hot water when available, solar pool heating alone may make the most sense for you. In every aspects we have pros and cons so its not a big deal. Jason I think your post contains a lot of worthy tips and information which will assist every pool heater in the Florida regarding heating pumps. So I will conclude that your post deserves a deep reading a lot of followers. Thanks and I really enjoy your post. I was curious as to why you didn’t consider the combination of the A/C with the Pool Heating recovery heat exchanger. I think that they are a viable option for Florida folks also. 1. 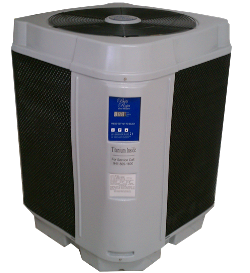 Air conditioners in homes typically do not run when pool heating is needed the most. In the winter, A/C is rarely used, so no pool heating would occur. 2. Newer air conditioners put out relatively little heat. As SEER ratings increase, the efficiency rises, so the amount of heat “recovered” is less. When we all had 9 SEER A/C units, heat recovery units for home water heating was pretty popular. With typical SEER ratings nearly double that, the amount of heat generated is low. In fact, we routinely remove heat recovery units from domestic water heaters when installing solar water heaters. 3. The overall heat provided by an air conditioning unit, even if the timing/demand did line up well, is minuscule compared to the amount of energy required to heat a pool (water). Think of it this way – it takes far, far more energy to heat water than it does to cool air. It would not make economic sense to install the equipment required for heat exchange in this scenario. Hopefully that answers your question. One day maybe someone will produce a single compressor unit with dual heat exchangers that can selectively heat a pool or cool a home at different times of the year, but I don’t think attempting to do this simultaneously with a single unit is the best strategy. It would be too hard to do both jobs effectively. Great Site. I’ve been learning a lot. I just payed $5.39/g for LP in Mid May, midwest Florida!!!! I went out to my tank and turned off the gas. So I bought four 4 X 12 Fafco Revolution panels to work on bringing up my temp a few degrees. Two are connected so far and I haven’t noticed much increase in temp today which is the first day I have run the panels. I will be putting the 2 other panels up next weekend. I am currently at 77 degrees water temp inside a birdcage with a fair amount of shade covering the pool. I have a 20K gallon running a single speed pump. Plumbing is 2 inches through the panels, but needed to reduce to 1 1/2 since all my other plumbing is from the late 80’s. I have read about flow rates and you have mentioned some flow metering for variable speed pumps, but how about for 1 speed? Can I control flow rates to benefit my set up by half opening the ball valves to the intake of the panels to slow my flow? What is the effect on water pressure by adding more panels? And how does adding another panel affect flow rates? Will 4 panels be effective for my goals? Was you system installed be an authorized FAFCO dealer, or is this a DIY system? One point – you should use 2″ plumbing for the entire collector loop (up the wall and on the roof and all bypass and isolation valves) to get the best performance (most flow). Hopefully you did not use 1-1/2″ right up to the collector headers. It sounds like you are trying to reduce flow through the panels. 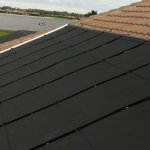 There is a common misconception that you want to slow down the water the get the greatest heat rise in the panels. That is generally not the case. Higher flow rates (to a point) result in better overall heating performance. You want to move a lot of water with a small temperature rise. Solar thermal collectors become less efficient as they get relatively warmer. At a certain point, the temperature rise may become so low that it is lost in the return plumbing. You are looking for about 8 gallons per minute in the collector loop. With only two panels, you may want to open the bypass partially as you suggested. A flow meter helps tremendously with this. The effect on water pressure for more panels should be negligible. Since you are adding panels in parallel, not series, there will be little effect on the overall flow rate. The flow rate per panel will be less, but overall flow rate will not change substantially. System sizing is a bit complicated since there are so many factors involved. A 20k gallon pool is pretty large for Florida, and a six panel system may be undersized in many cases. It all depends on your desired temperature and the other complex factors involved. If there is enough roof space, we often see 8-12 panels on a 20k gallon pool being the best solution.